Classic FM took legendary broadcaster Joan Bakewell to the Red House in Aldeburgh to meet the women who knew composer Benjamin Britten best. Benjamin Britten is a truly global figure. He composed some of the most appealing classical music of the 20th century and had an outstanding reputation as a pianist, conductor and recording artist. To celebrate the man and his music, legendary broadcaster Joan Bakewell went to Britten's home - the Red House in Aldeburgh, Suffolk - to hear exclusively from the women who provided the support system that underpinned Britten's life, from family and work, to home and health. The Red House, now home of the Britten-Pears Foundation, is unique in the world. The home of Benjamin Britten and his partner Peter Pears, it has maintained a strong spirit of place and its collections tell the story of its inhabitants' lives in extraordinary depth. In the beautiful setting of the Red House, surrounded by Britten and Pears' extraordinary art collection, Joan Bakewell spoke to four women who were close to the composer. "Personally, I have many fond memories of spending time there as a member of the Aldeburgh festival board," said Joan Bakewell, "and it was lovely to return to speak to these women who knew Ben and Peter so well." Photo: Philip Vile. 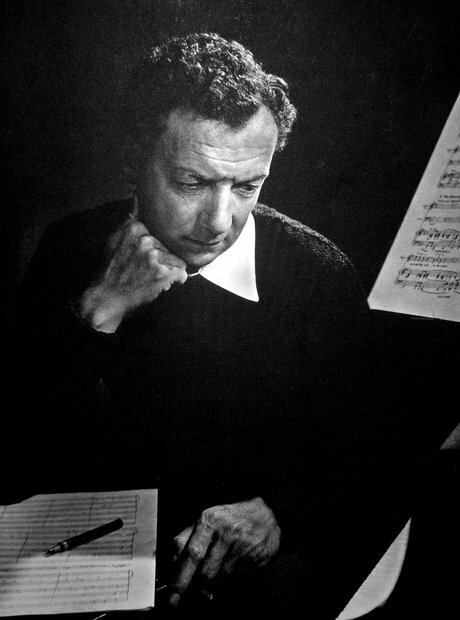 Britten underwent a successful heart operation in May 1973 but suffered a slight stroke. While in hospital he became friendly with a senior nursing sister, Rita Thomson, and persuaded her to move to Aldeburgh in 1974. Rita looked after the composer until his death and stayed on to nurse Peter Pears until his passing in 1986. The Red House remained home for Rita until 1999. Peter Pears' niece Susan also worked as Britten and Pears' concert agent. "Peter adored travelling," she told Joan Bakewell. "He was open to anything - loved new countries, new cultures. Ben in theory did - but actually he hated being away from home. He hated being away from composing." Susan Pears-Phipps recalled hearing Britten's music for the first time. "I think I was completely captivated by it...But it never occurred to me that it was different from – or in a way that one had to approach it differently from anything else. It was just one brilliant man writing brilliant music." Britten dedicated his 1957 opera Noye’s Fludde to Sally and her brother. "And we were so proud of that, as you can imagine," she told Joan Bakewell, "Even today, you know...as I’m telling you, I feel so proud!" Heather Grant went to work at the Red House at the age of 15 and stayed 51 years. "I was a great Cliff Richard, Billy Fury fan – all those," she told Joan Bakewell. But Britten and Pears didn't mind. "They used to pull my leg about it," Heather recalled. To mark Benjamin Britten's centenary, a magnificent new archive has been built in the ground of the Red House. This landmark building uses the most modern techniques to ensure that the priceless collection can be stored in safety and preserved for generations to come. Britten rarely threw anything away and the whole of his extraordinary life is documented in detail at the new Red House archive. Manuscripts of more than 700 pieces of juvenilia and all the mature compositions; diaries, thousands of letters, photographs and recordings and countless other artefacts - including this musical instrument made of mugs for Noye's Fludde. At the Red House, it's now possible to even buy an Aldeburgh Edition of Monopoly, with the Red House and other significant landmarks in the life of Britten and Pears. Together with Peter Pears, Britten created a remarkable legacy: extraordinary vocal music, a revival of English opera, the Aldeburgh Festival and a unique and extensive archive. "I hope when you next go to a Benjamin Britten concert or seek out his music," said Joan Bakewell, "you’ll not only think of the lives touched by his genius, but of the people who were there to offer support and comfort." Photo by Victor Parker © BPF.